Before you can actually make your way to the beach, you need to get to the island of Rhodes itself. 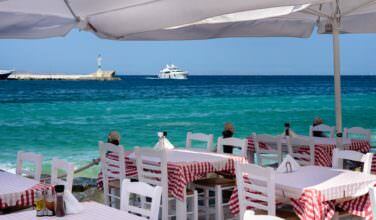 Since it is one of the larger, more popular islands in Greece, you do have a few options. First of all, you can take a flight into the regional airport. 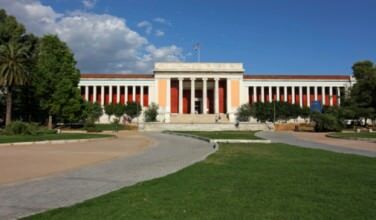 There are flights that leave from the Athens Airport as well as other places throughout Greece and in the surrounding area. You can also take a ferry from one of the local or major ports in Greece. Once you get to the island, you are free to head to the beach. It is located about 40 kilometers, or 25 miles, away from Lindos, which is the main town on the island. As mentioned above, this beach is close to Lindos. If you’re originating from that town, you’ll want to head south until you get to the beach. It should take about an hour to get there by car and since the route is mostly by the water, you may want to take even more time than that to get to the beach so you can enjoy the views. Once you arrive there, you will notice that it is a pleasantly scenic beach that has some facilities. You may also see that there is slightly more wind here than you might expect. Windsurfing enthusiasts from all over the world come here to find great wind conditions to pursue their sport. It is also a great beach for lounging, swimming, enjoying the view, and also soaking up the sun. This beach is entirely made of sand, unlike some beaches in Greece where the shore is made up of fine pebbles. There are two coves here that provide a nice escape from the wind and allow for pleasant conditions for bathing and relaxing. While here, you’ll want to walk along the beach, soak up the sun, and even swim in the warm, gorgeously blue water. If you love windsurfing this beach should top your list since it offers some of the best conditions in Greece. Even if you’ve never done it before, you can still try it out. Consider hiring a guide to explain to you how to do it. 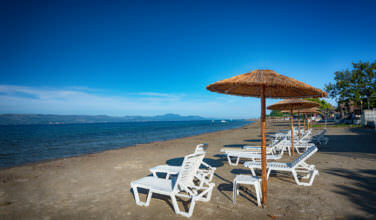 Lounging at the beach is one of the most popular activities in Greece. While on Rhodes, you’ll want to spend time at Prasionisis Beach, which is easily accessible from Lindos, the main village on the island.